This is what I made Saturday evening for dinner along with some homemade baked sweet potato fries and I forget just how much I love it! It's a great option for those of us who have a gluten intolerance/sensitivity. I forgot to take a picture of mine but here's the picture and site I found it on. I hope you enjoy! Cut the cheese slices into strips about 1/2 inch wide, and a bit shorter in length than the “long side” of the chicken breasts. Stack into 2 piles, one for each chicken breast. Lay 2 pieces of ham on a flat surface so that they overlap by about a third. The total length of the ham should be about 1 1/2 inches longer than your cheese strips. Place one stack of cheese in the center of the ham slices, then fold the short ends back over the cheese. Start at one of the long sides and roll it up like a burrito. Repeat for the remaining ham and cheese. Place a ham bundle, seam side down, in the center of a butterflied chicken breast. Fold the chicken breast completely around the ham. 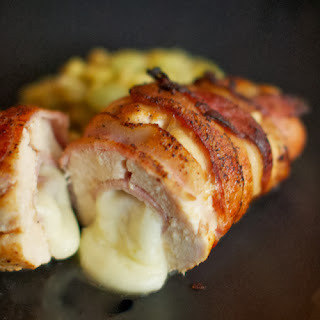 Take 3 strips of bacon and wrap around the chicken breast to hold it all together. Secure with cooking twine or toothpicks. Repeat for the second chicken breast. Preheat the oven to 375F. In a heavy skillet, brown the bacon-wrapped breasts on all sides. Place the chicken in the oven — in the skillet if it is oven-proof, or transfer to a small baking dish. Bake for 40-50 minutes, or until the temperature at the center of the chicken is around 155-160 degrees. Remove from oven, and allow to rest on a cutting board, tented with foil, for at least 10 minutes before serving. Just remember, just because something says it's "gluten-free" doesn't make it healthy.